Large cast belt buckles have been used for decades by military personal, police & fire departments, park rangers and other men and women. This is a product that will likely be treasured for a life-time. Each belt buckle is cast with lead free zinc alloy and then hand polished and hand painted. A standard latch and hook backing is included. Other styles are available as well upon request. 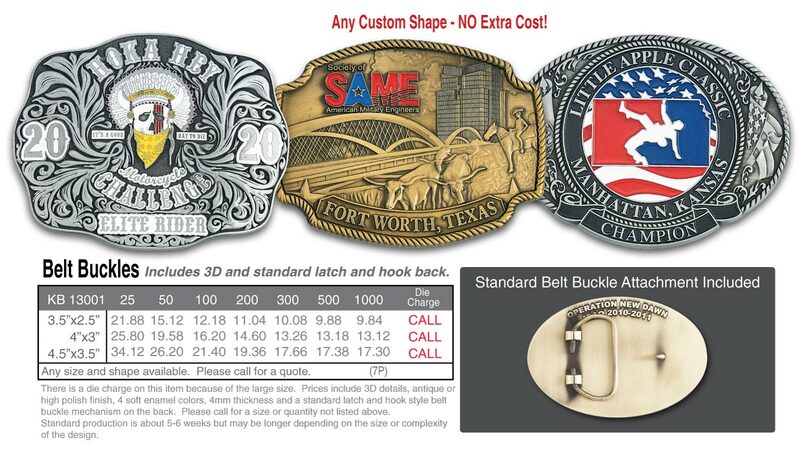 Below are examples of belt buckles we have made in teh past along with general pricing. For this product, we recommend you contact your sales representative for an exact quote, as there are many available options we cannot list on the website or catalog.